The Australian Open Tennis tournament is known as one of Melbourne’s most anticipated events of the year. This Grand Slam Tennis tournament will take place from Monday 14 – Sunday 27 January, 2019. This year, 2019 the Australian Open will celebrate their 107th edition of the tournament. The tournament consists of both men’s and women’s singles and doubles draws as well as mixed doubles events and is played at Melbourne Park Stadiums. 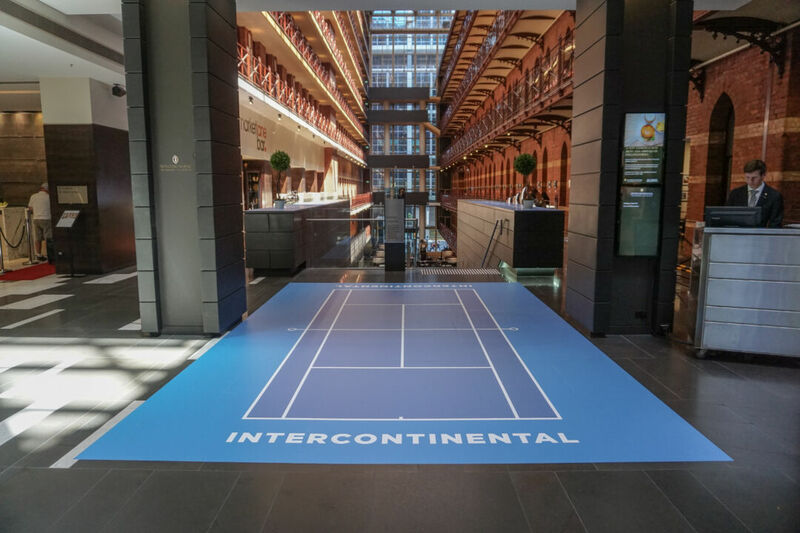 As one of the five star luxury hotels in Melbourne, InterContinental Melbourne The Rialto located on prestigious Collins Street is home to a buzz of excited international, interstate and local guests travelling to Melbourne for the tournament. To welcome a hotel full of AO fans, the hotel definitely knows how to put on a great activation. 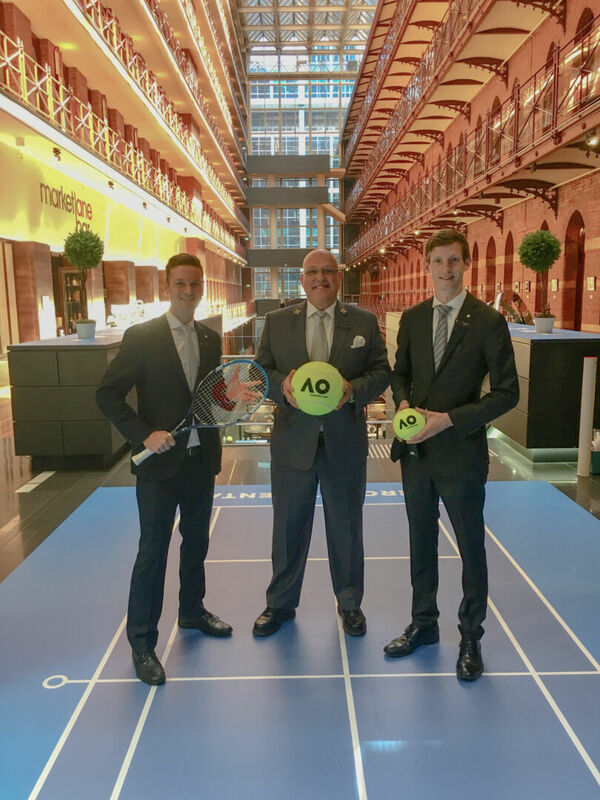 The lobby features a large 6m Australian Open tennis court replica as guests arrive and take in the views of the atrium and heritage buildings. Tennis courts have also been replicated throughout the hotel through the lobby pillars, all the way down to the Bluestone Wine Lounge, to the breakfast attendants dressed as ball boys and girls. The award winning bar located on Collins Street level Market Lane Bar, specialises in cocktails created by resident mixologist, Tetaawhi Patena. The hotel welcomes a variety of guests travelling to Melbourne not only for the Australian Open but also to spend a beautiful summer in Melbourne. The concierge team are known as one of the best in the industry and in Melbourne and is headed by Chief Concierge and General Secretary of Les Clefs d’Or International, James Ridenour. Left to Right – InterContinental Melbourne The Rialto concierges, James Wain, James Ridenour and Max Wilton. InterContinental Melbourne The Rialto is located on prestigious Collins Street in Melbourne. Located a 10 minute tram ride away from Melbourne Park Stadiums. The hotel’s current summer special, gives guests up to 35% off your next stay. Valid for stays over the Australian Open, get in quick promotion ends 11:59pm on 22 January, 2019.